On Feb. 14, Fayette Christian School is hosting a “We Love Our First Responders Appreciation Luncheon.” From left to right, FCS student Nate Crichton, firefighter Jody Langley, Lt. Martin Rennison, FCS student Andrew Peterson, firefighter Stephen Yeoman, FCS principal Larry Fitch and FCS student Grace Sheeter. A hero is often noted as “an ordinary person facing extraordinary circumstances and acting with courage, honor and self-sacrifice.” Those are exactly the folks Fayette Christian School is inviting for a special “We Love our First Responders Appreciation Luncheon” on Feb. 14 from 11:30 a.m. to 1:30 p.m. in the school gymnasium. All volunteer and full-time local law enforcement, firefighters and emergency responders are invited to attend. Guests will enjoy a catered lunch with the company of FCS students. At 12, there will be a brief program to recognize the courage and sacrifice of these men and women. Fayette Christian officials hope that our first responders will make plans to attend. Please RSVP through your local station by calling FCS at 740-335-7262 or texting Nancy McClish 740-572-1627. The lunch is an informal open house from 11:30-1:30, so please come and go as your schedule permits. Fayette Christian School is located at 1315 Dayton Ave. in Washington C.H. 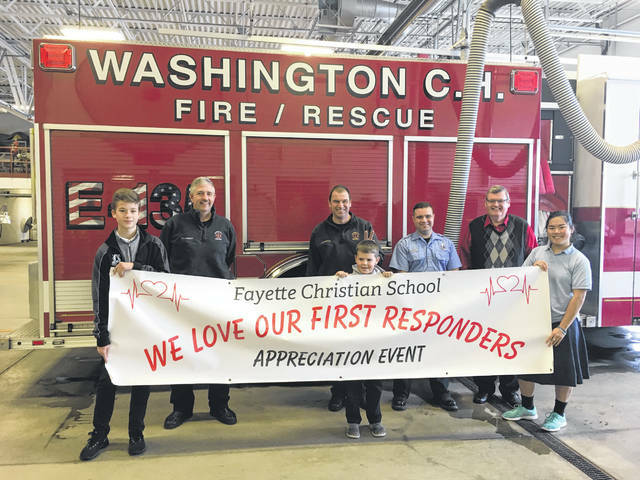 https://www.recordherald.com/wp-content/uploads/sites/27/2019/01/web1_2019-Press-Release.jpegOn Feb. 14, Fayette Christian School is hosting a “We Love Our First Responders Appreciation Luncheon.” From left to right, FCS student Nate Crichton, firefighter Jody Langley, Lt. Martin Rennison, FCS student Andrew Peterson, firefighter Stephen Yeoman, FCS principal Larry Fitch and FCS student Grace Sheeter.